Breathable pink and gray mesh with stretchy V neck for comfort. Doggles knows how to make dog harnesses comfortable and easy! 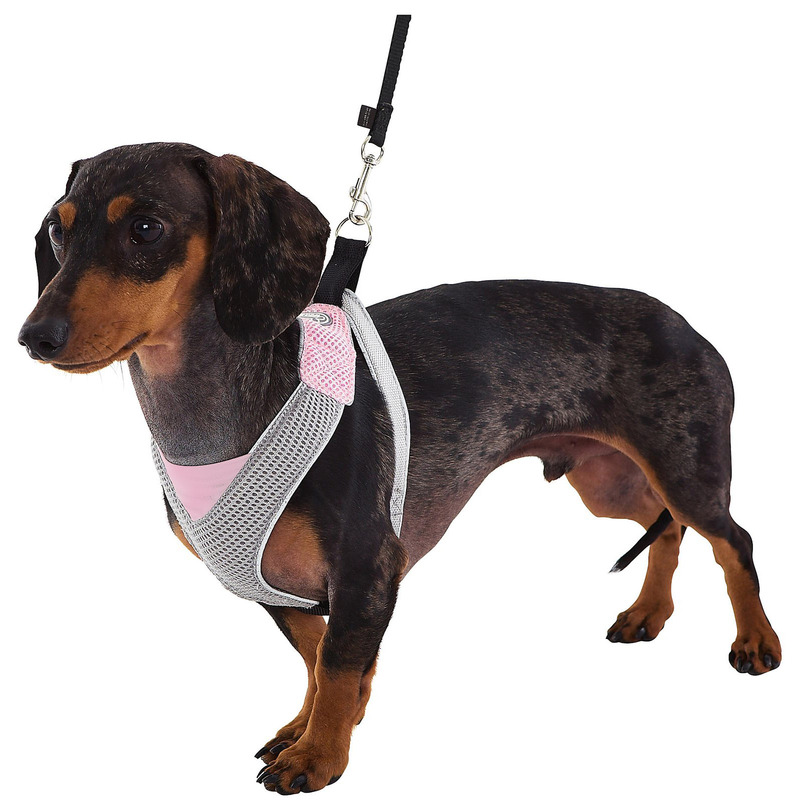 This Light Pink and Gray V Mesh Dog Harness has been praised by some as the best fitting, most comfortable, and most durable small dog harness on the market! Harnesses are useful when walking small dogs because they don't add strain to their fragile frames. 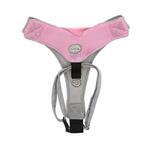 Doggles Pink & Gray V Mesh Harness Customer Photos - Send us your photo! Lily likes this new harness because it does cause tangles in her ruff! and it comes in PINK! Posted On 06/21/17 by Rosemary J from Evansville, IN Yes, Rosemary J recommends this product! Easy to put on, comfortable for the dog and the mesh makes it cool. Love the color combination too. Posted On 04/21/17 by Gia from , PA Yes, Gia recommends this product! My little one seemed more comfy in this one than in any other harness she's had before, but I did have to exchange it for an even smaller size because she's a miniature dotson. Posted On 11/07/16 by Judy S from Toms River, NJ Yes, Judy S recommends this product! I bought this for my mini doxie and it is a perfect fit and doesn't pull on her neck. I have better control of her when walking her. Posted On 07/18/16 by Karen D from San Diego, CA Yes, Karen D recommends this product! Would not have bought if seen in person first. Can not tell from photo how narrow the straps are. Posted On 03/29/16 by Roberta R from Hendersonville , NC Yes, Roberta R recommends this product! Absolutely love this harness. I highly recommend it. I have a yorkie and a cocker spaniel. Harness is very easy to put on. Posted On 07/28/15 by john M from Hansford, WV Yes, john M recommends this product! Posted On 07/13/15 by Jamie D from Philadelphia, PA Yes, Jamie D recommends this product! I wasn't sure if this harness was going to fit my dog correctly, because she has long hair & sizes can be tricky. There was a really big room for size adjustment so I was able to fit it perfectly to her comfort. Posted On 05/26/15 by Brenda H from Minrovia, CA Yes, Brenda H recommends this product! Looked high and low for a harness to fit my mini doxi. This one fit the doxi in the picture so I thought I'd give it a try. Now she looks just like the picture. Thanks baxterboo! Posted On 05/17/15 by Laura E from Oakhurst, TX Yes, Laura E recommends this product! Great for my Pug but the medium was too big, even for my overweight girl. Measure the back length as well. Going to order a small. Mia likes this lead and I like the ease of putting it on her. It is rather soft and appears to be a well built product. Love shopping for my fur babies here!